Not sure how I feel about this one. 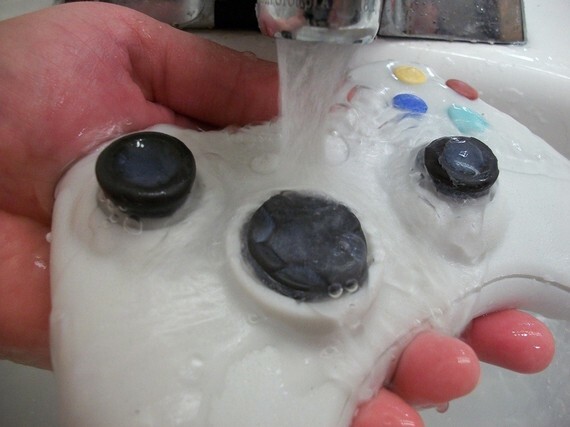 But a group called Digital Soaps has put together a soap version of the Xbox 360 controller. I don’t think theres a bigger way to prove you are a fanboy than scrubbing your armpits with the 360 guide button. Would you buy this? If you want to really buy one you can travel over to their Etsy page, I think they are selling out. The Xbox soap weighs six ounces and has raised buttons. This one comes with the added addition of colors, so it looks even more realistic than the others. Despite its weight and size, it fits well in the hands…unlike the original Xbox controllers. Made with great quality glycerin soap. Scented with Mountain Dew fragrance oil, a gamer’s best scent. Made by the original creator of video game controller and electronics soaps, DigitalSoaps. Please see my shop announcement for current promotions! I vow to continue providing you with the latest and greatest gadget soaps in my Lvl 3 quest to drench the gaming community with awesomeness!